The supporting cast of the album includes a virtual who’s who of French neo-psychedelic music, including Eric Cougrand, Jean-Michel Laugier and Alexandre Manconi, together with the kaleidoscopic and powerful post-production mixing skills of Xavier Dorémus. And those who obtain a physical copy of the CD will be treated to the very special art of Yves Courson that graces not only the album cover, but the disc itself. If you’ve been longing for an album that brings the essence of psychedelic music into the present-day, Jamasutra’s “Revolution Down the Road” recaptures the spirit of a magical time and brings it into the present day. 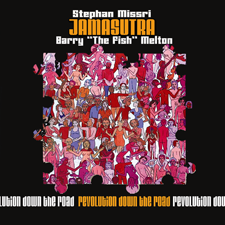 Album produced by Stephan Missri & Barry Melton.